Chill-Shields are 360o thermal hanger shields designed to meet pipe support applications on low temperature lines. 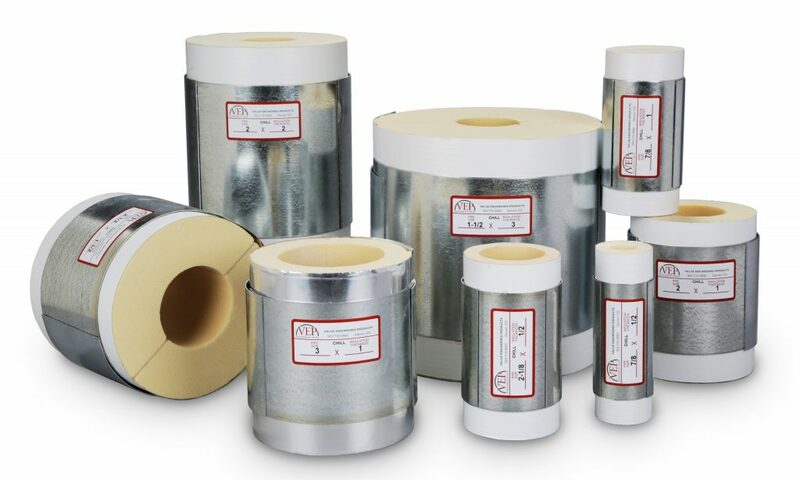 They provide a continuous section of insulation and vapor barrier, and are designed for pipe systems operating between -250o F. and +225o F. The insulation and vapor barrier extend beyond the galvanized steel shield for a neat, vapor-tight joint with the adjoining insulation. Chill-Shields are suitable for use in clamp, clevis or other band-type hangers. High-compressive strength polyisocyanurate inserts and heavy gauge steel shields ensure proper pipe support. These cost-effective designs meet the requirements of either pipe or tube systems. For indoor use on clamping support systems, clevis or other band-type hangers. Chilled piping to domestic hot water. Hanger spans per MSS SP-69 Table 5 (not suitable for extended hanger spans). Standard design available for pipe 1/2 inch through 8 inches. 360o Polyisocyanurate 24 PSI or 40 PSI provides cost effective support for pipe and tube up to 8”. Larger pipe sizes will require higher compressive strength inserts. Please contact plant for recommendations. Meeting ASTM D-1621, D-1622, D-1623, C-203, C-518 and E-84, Flame -25-, Smoke -450-. 360o Non-reactive vapor barrier jacket meeting ASTM D-774, D-828 and E-84, Flame-5-, Smoke -5-. Adhesive complying with NFPA 90-A and ASTM E-84, Flame Spread -10-, Smoke Developed -0-.